Today's ride was distinctly more scenic day than Saturday's route. In fact in my opinion this is the most scenic part of the Transpennine trail as it involves crossing the Peak District with its beautiful moorland. The only snag is that when crossing a national park it is impossible to escape climbing up lots of hills! My ride started from Stockport train station, from where the Transpennine trail was signposted on immediately exiting the station. 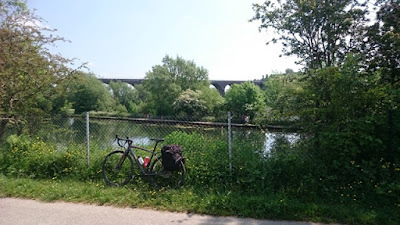 Within a short ride of Stockport town centre I was in peaceful parkland with woods and a lake, giving intermittent views of the impressive Grade II listed viaduct - the most noteworthy thing in Stockport. The route was was pleasantly shaded, which was needed on this a hot day. At the other end of this woodland the path led me into the affluent areas of Godley and Broadbottom Village. They looked such cute neighbourhoods with just a few houses and pretty window boxes congregated around a mini hamlet green. Given the location, on the edge of the Cheshire hills the residents would have also had a permanent picture postcard to look at from their window. As I had paid handsomely for my train ticket to get there, and I had ridden cross-country most of the previous day, for a moment I wondered if I should pack up London life and come and live in Broadbottom Common permanently. Why not just stay and enjoy the idyllic life up here without having to schlep up and down on my bike! Then reality hit me when I saw a few cars get caught in a mini traffic jam on the lane leading up to their homes, and I rode through a swarm of smelly flies. Maybe I prefer to just visit these places with their pretty cottages and decorative motifs, then admire them a little before heading homeward bound to London. In contrast to the previous day's ride, this day was definitely lumpy. 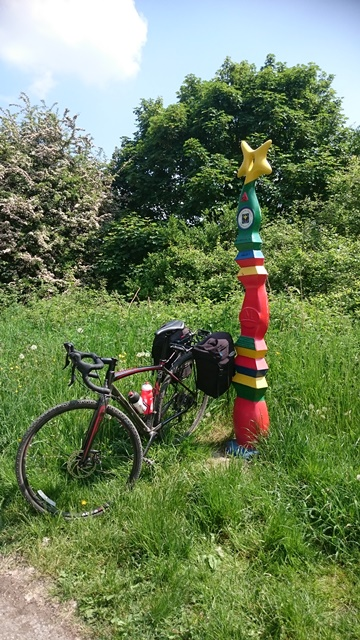 There was a fair bit of climbing involved, and sometimes I had to wheel my bike. It was impossible for me to lift the bike or wheel it up steep inclines and at those moments I was obliged to remove one pannier and carry it in my hand while wheeling the bike, which was still not easy. The gravel bike is a robust machine, that is significantly heavier than my cross bike - even more so, with the panniers attached. Added to that all the hills I had to surmount meant this ride gave me a full body work-out! Having said that, being on the gravel bike I felt confident that it could cope well with the different types of terrain, and it moved quicker than if I had been on a mountain bike - particularly on the road sections. Torside and Woodhead terrible twins! Broadbottom represented the end of one district - Tameside. I was now in Derbyshire where the landscape definitely took on a rural theme rather than a Manchester conurbation feel. Passing through the villages which were a magnet for country pub traffic, it was tempting to stop and join the masses on this sunny Sunday afternoon. But I was conscious of the time and didn't want to finish my ride too late in the day. So I pressed on with following the signs for Longendale and Torside. This area was vaguely familiar to me as I was near the villages of Padfield and Hadfield which I recall going to a couple of years ago when the Tour de France came to Yorkshire. 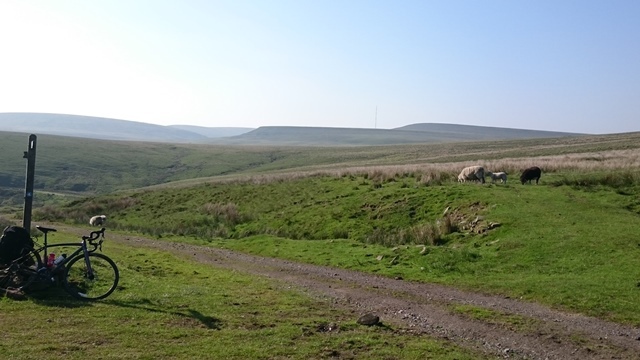 For Stage 2 of the 2014 Tour we parked in Padfield, cycled down to Torside Reservoir, and then climbed up Holme Moss to see the professional cyclists struggle over what must have been one of the hilliest debuts to a Tour de France edition. As Torside had been part of the stage into Sheffield I had lured myself into a false sense of security that once I got to the reservoir I wouldn't be far from Sheffield, and then it would just be a hope, skip and a jump (or as near as is doable on a bike) to Doncaster, my planned destination for the day. 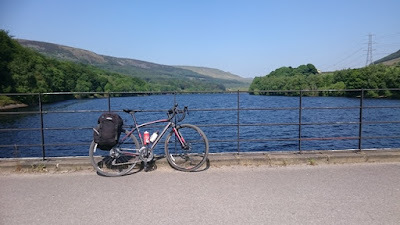 Arriving at the start of the reservoir I was greeted with a beautiful sight of the Peak District hills surrounding clear blue water laced with yachts. The path went slightly awry at this point and I had to take a detour as work was being done on the paths. A local mountain biker offered to ride with me in order to show me the revised route. But I felt I would be so embarrassingly slow that I declined his offer. Fortunately, I was able to follow his detailed description of the directions, but unfortunately this was the most challenging part of the day up to that point. It involved riding (mixed in with some walking) up an incredibly steep trail over stones. Even pushing my gear up the hill was a challenge. What a relief to get to the top, even if I was absolutely dripping with sweat! As I heaved a big sigh of relief, trying to get my breath back, my heart sank as the bike decided to get another puncture! Typical! Well, punctures had been the order of the day over the last 24 hours so I just got it sorted and pressed on. This section of the route goes along the Longendale trail which in my opinion really is the best part of the ride. 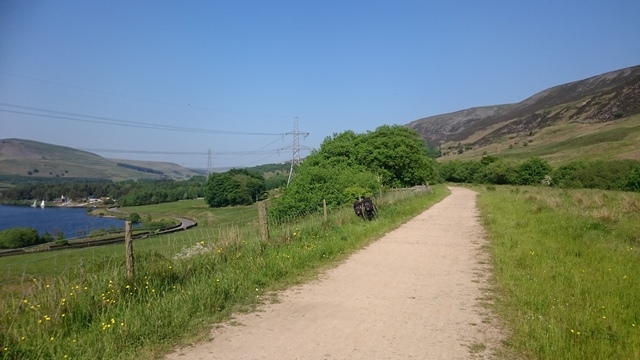 A welcome change from the pull up from Torside, this disused railway is nice and flat, and you are accompanied by spectacular views of the reservoir as you pass intermittently through woodland. The trail is around 6.5 miles long and not technical so you can motor along this trail on a mountain bike or cyclo cross bike - and there were many cyclists out doing exactly that. 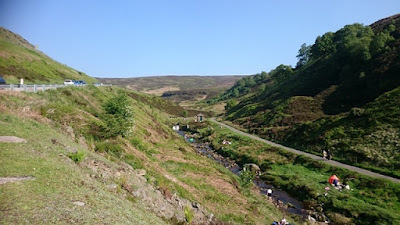 Finally, the trail ended at the Woodhead disused railway station and tunnel. Also at that point the flat riding stops and I was back honking my way up a gravelly path with all my baggage. Note to oneself - there is a river below (the Etherow) where it is possible to lounge on the bank and sunbathe beneath the Woodhead tunnel. A few sunbathers were down there enjoying the last part of this sunny day and it looked better than any beach - views of the majestic mountains, a peaceful lake and no fights over beach space. I must go there. But not today! Fleeced on the shear climb over Woodhead! There I was thinking I was about to embark on a long descent into Sheffield. But in fact I was caught out and ended up climbing even more! 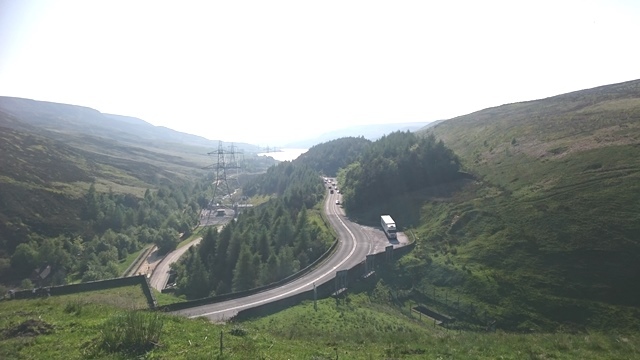 If the hill up from Torside reservoir was tough, the climb over the Woodhead Pass was a real knock-out. The trail twisted and turned as I headed higher and higher. The main Transpennine road sank lower and lower beneath me, as I was winched further and further skywards. At times it was impossible to ride, such was the steepness of the gradient. I was all alone on the moorland at this point, and became slightly worried that I might have taken the wrong way only to be lost in depths of the hills and I would never get home that evening. In fact, even though I was in a remote place there were still signboards for the Transpennine trail, and also signs to get to other places like Stalybridge and Ashton-under-Lyne, which were near where I had come from. This was not the time to get the signs wrong! It was really eerie being up there with just sheep and cows for company, and even they ran away from me at the sound of my desperate panting! Although I could see where I needed to get to the bridleway seemed to took a somewhat circuitous route which made it somewhat disconcerting and I wondered if a mischievous sheep had managed to jump up and twist the signs the opposite way as a joke! Later on through my trek I bumped into human life - three mountain bikers passed me in the opposite direction and greeted me. It was a relieved to know that I wasn't the only mad person up on this Godforsaken place on my bike at a time when folks would be settling down for Sunday afternoon tea or even dinner! Eventually the bridleway threw me down onto a tarmacked road which took me on an amazing descent to Dunford Bridge. Was I near Doncaster? Nowhere near at all! Well it was 6pm and I wasn't really in the mood to do all that. So in the end I followed a disused tarmacked railway line through Penistone (formerly known as the Great Central Railway line) and then diverted to Silkstone Common just outside Barnsley, where I got on a train to Sheffield. Doncaster could wait till tomorrow. This stage had been hard work but I was really glad to have ridden through it. I can see myself returning there with no luggage and doing a training ride from Stockport to Penistone. The Longendale trail is very pretty and would make a great training route. During the day lots of mountain bikers were out on that route doing just that. I would also say it is a great route for a cyclo cross rider too and I would definitely use my cross bike. For now though, I just had to resign myself to the fact that I was a sluggish cycle tourist!